This guest commentary was written by Jeffrey Snider from Alhambra. Over the weekend, another European nation turned toward the populist direction. 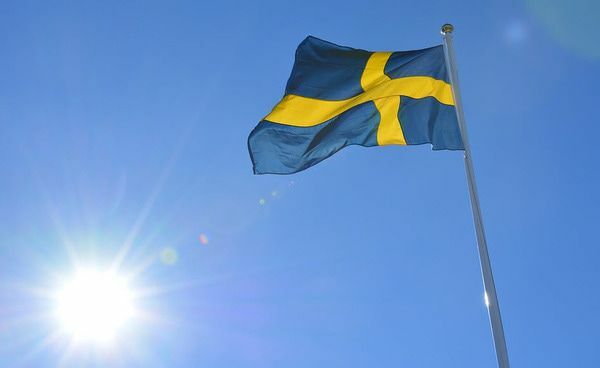 It was enough to get one’s attention when Italy did it, but Sweden is something else altogether. The country has been long held out as an exemplar of everything that is right with globalization. They have industry, youth, etc. How in the world could another “far right” party score so much? I detest these politics, largely because they are wildly unhelpful. The mainstream has walled off all discourse into these neat little boxes. The reason a far simpler explanation can’t be put forward, one that encompasses all these entrenching passions, is the stink of Economics. 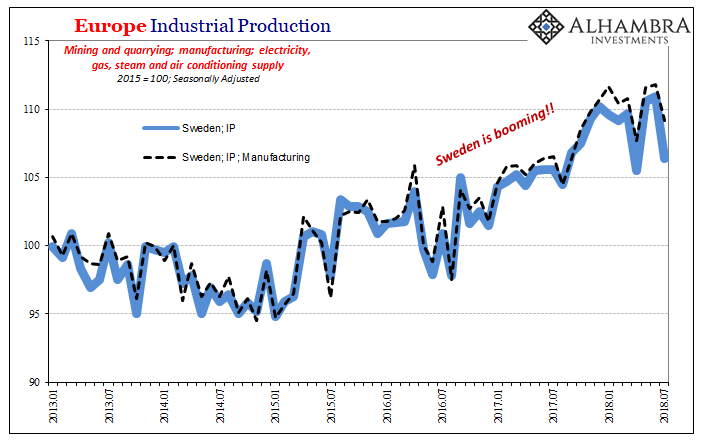 Sweden is an economic paradise, we are told, a steady industrial powerhouse. Furthermore, right now, Europe’s economy is booming. Central bank policies, including those pursued by the often aggressive Riksbank, have allegedly succeeded. Vast political disassociation therefore must be about something else. Except, it’s not. Not really. There will always be extremes. These aren’t typically palatable options because most people want to be in the center. It’s only when the center doesn’t, or can’t, offer plausible, sensible solutions and ideas that extremes however distasteful can become the only realistic options. Swedes, as Italians or Brazilians, know that meaningful change must today be forced on the reluctant political establishment of “both” sides. Time and again we see this same pattern all over the world. Economists will have you believe macro history in Europe began with the ECB’s NIRP in 2014, or its QE in 2015. Things are mostly positive since, and in 2017 they were more positive than usual. This is a false sense of economic progress because it omits the wider context that instead declares how each economy, save a few like Germany, has actually shrunk. Following repeated downturns often quite severe this is where the political story isn’t really about the far right or the far left. It’s about Economists who refuse to allow they really, really don’t know what they are doing. The positive rhetoric surrounding Reflation #3 in Europe was simply mischaracterizing the situation, and mostly out of mainstream desperation. The upturn that began in the middle of 2016, and not because of some delayed reaction to the ECB’s policies, was greater but only in comparison to Reflation #2. This mild difference was predictably attributed to central bank aggressiveness, and then wrongly extrapolated into a full recovery scenario (because Economists and central bankers don’t understand what’s really driving the global economy in either direction). 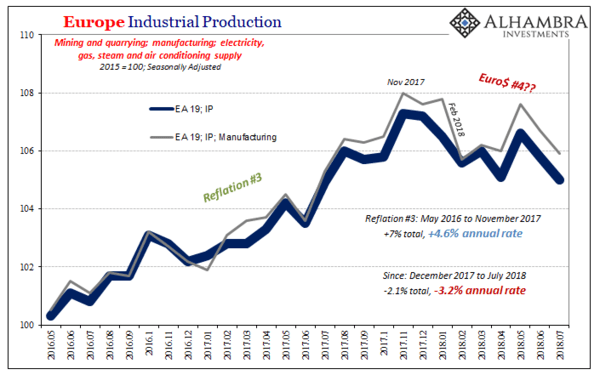 Thus, Europe, like the rest of the world, is facing the prospects of realizing just how oversold Reflation #3 has been at the same time as the increasing likelihood it has already ended perhaps many months ago. 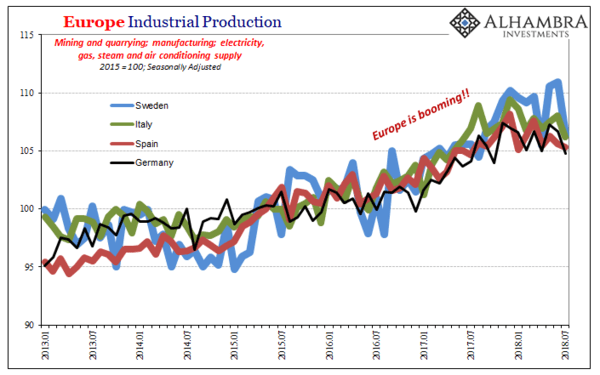 Industrial Production in Europe, one of the key components to Europe’s 2017 “boom”, has been lower since last November. 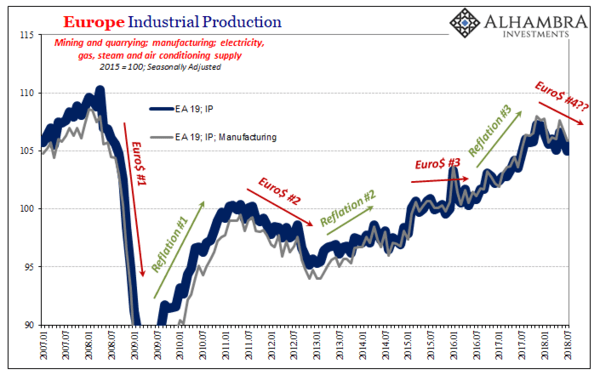 It tumbled in February following the big eurodollar eruption that resulted in stock market liquidations at the end of January (among other monetary “anomalies”). 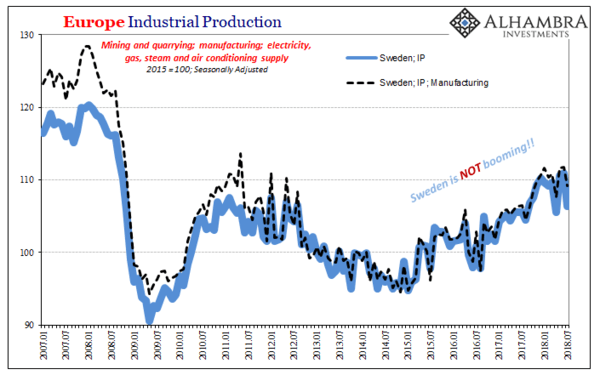 IP had rebounded somewhat in May 2018, leading many to jump the gun and declare the interruption “transitory” projecting the recovery would then proceed as expected. However, Eurostat’s update for July 2018 shows now a second consecutive monthly decline since (both June and July). At a seasonally-adjusted index value of 105 in the latest month, that’s lower than April. Lower highs and lower lows. The politics of Europe, then, are surprisingly simple at the same time they are increasingly terrifying. If Sweden’s economy can’t avoid the same eurodollar-driven upturn/downturn cycling as the rest of the world, what does that project for long-term prospects beyond the economy and beyond Sweden? The real danger is in how all this plays out under the increased social pressures of a shrunken, chronically sick economy where nobody trusts anyone because the status quo just refuses to accept that reality. Central bankers and Economists would rather the world burn than admit they’ve screwed everything up so badly. 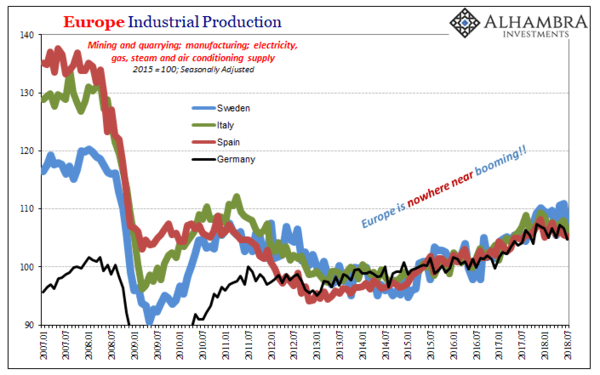 The way out is, therefore, right where it’s always been: central banks. Not in the next big central bank idea (that’s just recycling what Japan has already failed at), but in cleaning house and rethinking the whole thing from the ground up. The only question is which breaks first: Economists’ collective conscience, or the political structure? This is a Hedgeye Guest Contributor piece written by Jeffrey Snider, Head of Global Investment Research at Alhambra Investment Partners. This piece does not necessarily reflect the opinion of Hedgeye.